What a wonderful time we had at the Christmas Fayre this afternoon. 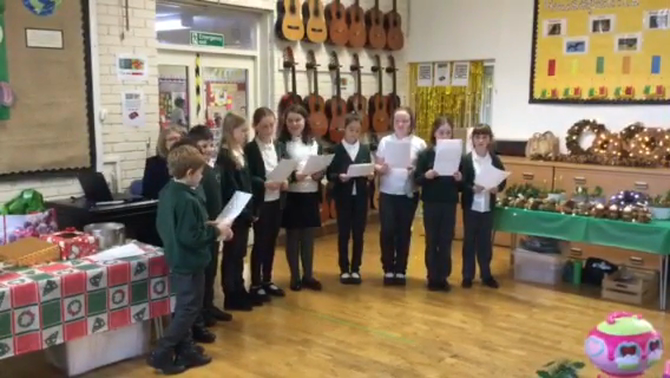 It all started at 3pm with the choir singing, which you can see in the video. There were lots of different stalls and games, including face painting, glitter tattoos, lego cards, baubles. A variety of stalls sold lots of different items, the school class stalls certainly did well. Our Secret Present workshop was very busy and the refreshments stall always seemed to have a queue! The Great Preston Bake Off winners were announced, it was a very difficult decision as there were so many amazing cakes, but well done to Harry Fleckney for the children's cake and Mrs Wood for the adults cake. They received their Preston Bake Off aprons and we all enjoyed eating the cakes! We also found out that the Elf's name was Ginger with Noah having chosen the correct name - I hope there's room in his bed! A huge thank you to all those people who helped on the day and to the fantastic organisation and planning of the PSA.